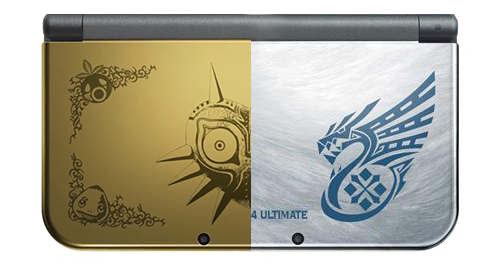 During Nintendo Direct a new handheld was announced and with it comes two limited edition variations. Both the The Legend of Zelda: Majoras Mask and Monster Hunter 4 renditions are well designed giving each one a unique look to start off the latest design from the 3DS line. The handhelds will both be made available in store on February 13 in both North America and Europe which will coincide with the release of the standard model. The Legend of Zelda: Majora's Mask model will be sold at retailers starting at $199. Though the North American version won't include a copy of the game, the game will come pre-installed. If you did not purchase the limited edition console, The Legend of Zelda: Majora's Mask will be made available for sale on the same day as the console. The 3DS version of the game will include a fully rotating camera that is operated using the C-Stick. Also announced was a special edition of the game which will include a figurine of Skull Kid. Pre-orders of the handheld have already been sold out among retailers in just 15 minutes of being eligible for purchase. Though slightly more expensive, the Monster Hunter 4 model will be a GameStop exclusive in North America but be made more widely available in Europe through other retailers. The handheld will be sold for $229 where a pre-installed copy of the game will only be on European models, same as Majora's Mask. The game itself has already had pre-existing crossover DLC from other various games and is set to receive another featuring content from Devil May Cry.